Genesis of Aquarion is an anime TV series written and directed by Shoji Kawamori, produced by Satelight. The science fiction series is a homage to the Super Robot shows of the 1970s and 1980s, executed with modern animation techniques and aesthetics. Set in the future, a giant fighting machine called the Aquarion is humanity's only effective weapon in the fight against the technologically advanced species called the Shadow Angels. Aquarion aired from April 4, 2005, to September 26, 2005, on TV Tokyo. An alternate retelling of the television series, the Genesis of Aquarion OVA, premiered on May 25, 2007. The television series is licensed in North America by Funimation while on the 14 February 2006 it aired on MTV Italia. On April 27, 2009, the series made its North American television debut on the Funimation Channel. 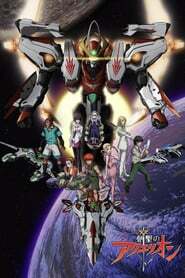 A sequel to the series titled Aquarion Evol was announced on February 25, 2011, and aired in 2012.